We live in a wireless world, surrounded by radio frequency (RF) networks that provide our communication, information, livelihoods and entertainment. Our computers, cellular phones and car door remotes all operate using RF technology, and we rely on it every day in a whole host of applications. Although these devices have come to dominate our personal lives, most of us lack a true understanding of how they work. We accept that they work most of the time, and when they don’t, we move, or we wait, or we turn them off and back on – eventually something seems to solve the problem. What about systems that must work every time, all the time? Can we take advantage of the benefits of RF technology in those systems as well? The answer is yes, but the key is to choose systems with the right technical specifications, as well as the right system tools. We have seen the rise of a new generation of residential Wi-Fi providers, who sell not only routers, but also survey tools so customers can check their coverage in real time. When binge-watching your favorite show, the ability to survey can be useful – when you are trying to install a security system in a commercial facility, it is critical. 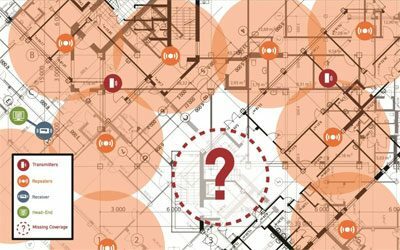 When choosing a wireless system for commercial security applications, be aware of the technical specifications – frequency-hopping, spread-spectrum technology and a robust repeater network – and always choose a system with good survey tools for determining and demonstrating RF coverage. A wireless device’s performance does not simply depend on the device itself. All wireless technology operates on the same basic principles, and the coverage is dependent on its ability to overcome obstacles. With RF technology, anything dry – wood, glass, air, etc. – is basically invisible. A radio signal will go right through drywall as if it is not there; however, anything wet causes attenuation, or a reduction in transmission power. Vegetation, human beings, concrete and earthen berms or hills all allow the signal to pass through, but it is attenuated. Likewise, anything metal reflects radio signals, and this includes the metal mesh common in commercial construction. There is also the issue of interference, especially in commercial facilities. Lights, electric motors and air handling units all give off electromagnetic radiation, or background noise, which can interfere with a transmission. Just like trying to hear a conversation in a crowded restaurant, if there is too much background noise, the conversation (or, in RF jargon, the signal) is lost. We are accustomed to negotiating RF obstacles in our everyday lives all the time. If we are using Wi-Fi and have a bad signal, we just move until we get better one – the same goes for cell phones or Bluetooth headsets. A fixed system, such as a commercial wireless system, does not present that option; and in the case of life safety systems – including intrusion and duress – there is no room for failure. Frequency-Hopping Spread-Spectrum Technology: Unlike the narrow band, single-channel systems used by many wireless devices, devices that use frequency-hopping spread-spectrum technology send the same signal repeatedly over multiple channels across a large RF spectrum. This ensures that if one part of the spectrum has high background noise, the signal will get through on another channel that does not. This technology was developed by the military to ensure signals got through on the battlefield. Commercial wireless security systems almost always use frequency-hopping spread-spectrum technology due to the many sources of interference found in commercial environments. Not only is reliable coverage a life safety requirement, the FCC mandates that signals cannot cause harmful interference, and must be able to work through any interference they encounter. This technology ensures these requirements are met. Repeaters are line-powered devices that retransmit signals from wireless transmitters to ensure they reach the receiver. They are a key component of any commercial-grade wireless security system. Repeaters are a necessity because of the need to cover entire commercial facilities, and, even with the advantage of frequency-hopping spread-spectrum technology, to overcome obstacles. For example, if you have a transmitter with a metal mesh wall between it and the receiver, a good repeater network will provide multiple paths between the transmitter and the receiver, enabling the system to work around the obstacles. Repeaters are essential for providing the ability to scale out the system and provide the complete coverage needed for larger facilities. While knowing you have repeaters at your disposal is certainly key, you also need a way to know how many and where to put them. It is through a repeater network that complete facility coverage is ensured; however, all repeater networks are not equivalent. Before installing a commercial wireless security system, the following questions must be asked. How many square feet does each repeater cover? A reasonable standard is 50,000 square feet. How many repeaters can I use? Oftentimes the number of repeaters is limited by the system, and sometimes that number is as low as seven or eight. You will need to know how repeater limitations will affect facility coverage. How do I know where to put the repeaters? Meaning, what tools are available to ensure the right number and placement. Proper repeater placement ensures maximum system performance. As such, nearly every commercial wireless security system has a way to help with installation – even if it is as simple as an LED on a transmitter that turns green to indicate connectivity with the receiver through the repeater network. The most effective tool, however, comes in the form of an RF survey kit to help determine repeater placement. This offers a way of seeing signal strength in real time, and should be simple enough that it can be used both to install the system and to demonstrate the coverage to the customer. The most advanced of these can monitor coverage in real time, and can do so on the same smartphone you would use to check your Wi-Fi coverage in your home. You can simply hang a survey transmitter where you are going to put the receiver, and walk away from it with a mobile survey receiver connected to your smartphone through an app. As you are walking, you can see the signal strength on a meter display. If the needle indicator stays in the green, the signal is fine and there is no need for a repeater; if it moves into the red, you start looking for a place to put a repeater. Once the location of the first repeater is determined, start the process again, hanging the survey transmitter where you plan to place that repeater. This creates overlapping circles of coverage, ensuring that if a transmitter activates in a covered area, the signal will have multiple paths, and find the receiver.